Rotary 14 is the place to be. What would prompt people to leave the high tech startup scene in California and start a business in Lincoln? If you were in college in Lincoln and had a great business idea, wouldn’t it make sense to build it where you are instead of moving to a bigger city? What if you’re a professor doing research and discover something worth developing . . . what should you do? Lincoln has a thriving and diverse startup community. From regular events, accelerators, coworking spaces and plenty of mentors willing to help . . . Lincoln is a perfect place to start something. 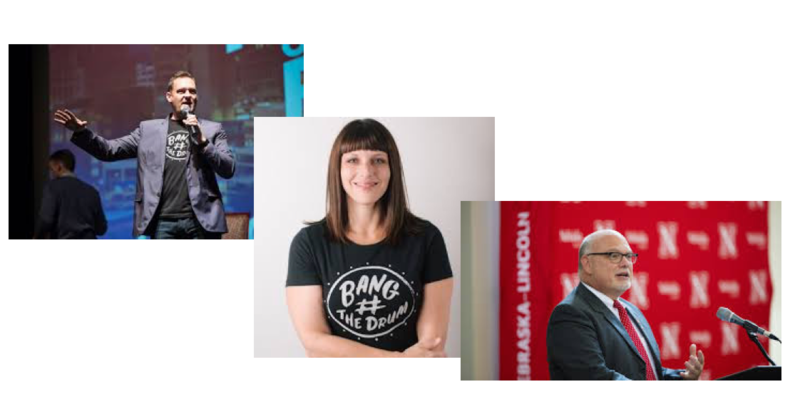 Our program on April 23 will feature presentations by three people closely connected to Lincoln’s vibrant startup scene. 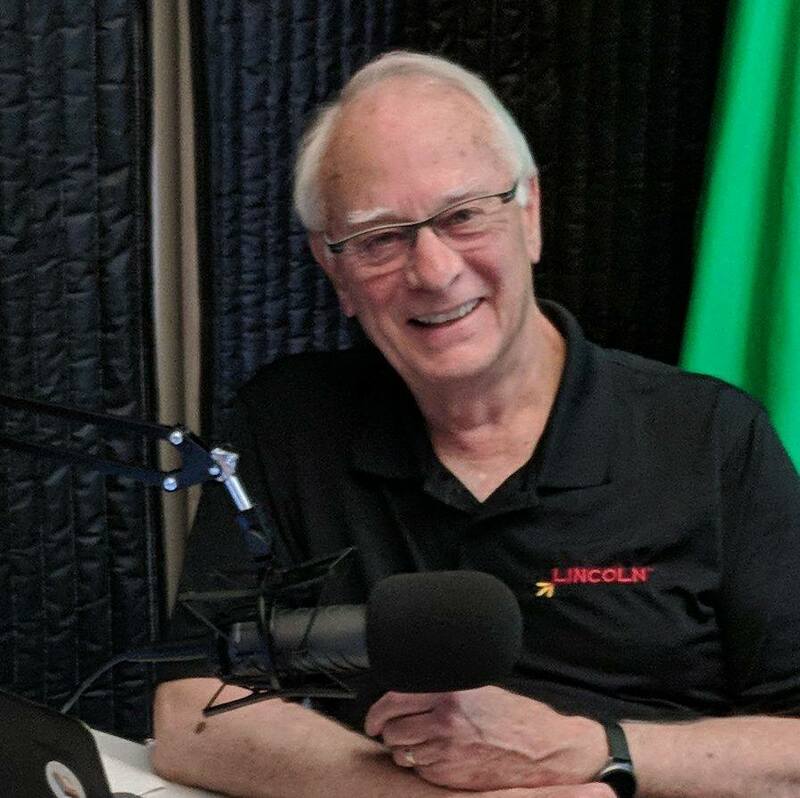 Brian Ardinger works with Nelnet, produces a weekly startup podcast and coordinates an annual conference. Christina Oldfather is in charge of fostering startups for the Lincoln Partnership for Economic Development. Brad Roth helps the University of Nebraska turn ideas to action. Join us for this informative program about Lincoln’s startup scene. Tickets are selling fast to one of the most exciting Rotary luncheons of the year! Buy your tickets here. government officials to honor an outstanding local business. This year, Lincoln Rotarians voted to honor Firespring. Tickets: $35 for individual tickets, $600 corporate sponsor. Tickets available now, click/tap here or buy at our weekly meeting. Sign up here to volunteer on April 30. We still need 7 volunteers. 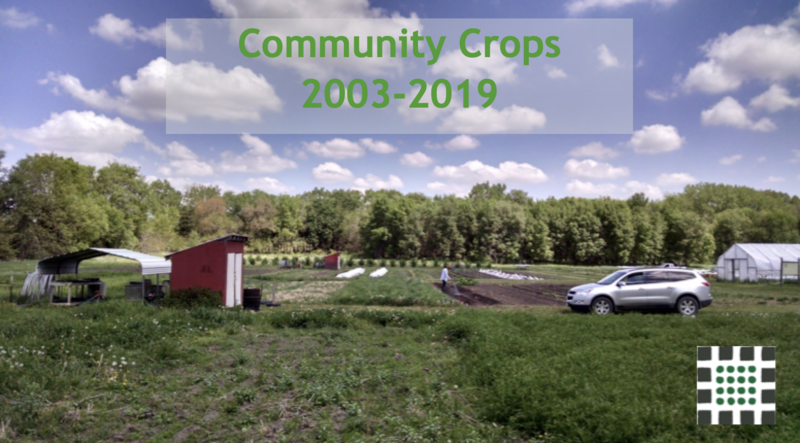 Community Crops is Lincoln's 501c3 Urban Gardening and Farming organization. It has sustained 15 years of steady growth, now with 10 urban gardens serving over 1000 family gardeners, most immigrants or refugees, and 80% below the low-income level. They also have an urban training farm at 112th and Adams St. It is at the forefront of the agricultural sustainability movement in Nebraska, a concern that all can join in support for future generations. David Grabarkewitz, Community Crops Executive Director is our speaker on April 16th. Read more about the speaker here. A tiny little insect, the Emerald Ash Borer, has reached Lincoln and it’s infecting many of the city’s trees. There are more than 14,000 city-owned ash trees in our parks, golf courses, our yards and along our streets. During our program on April 9, Lynn Johnson, Director of Lincoln Parks and Recreation, will share the impact of this insect and what the city is doing to combat it. A year ago Rotary 14 responded to a challenge to plant at least one tree for every member of our club. We started the project last Fall and Johnson will give us an update on the project. What inspires you? Is it a good book? Maybe it’s a great song? For sure it’s a special person in your life. 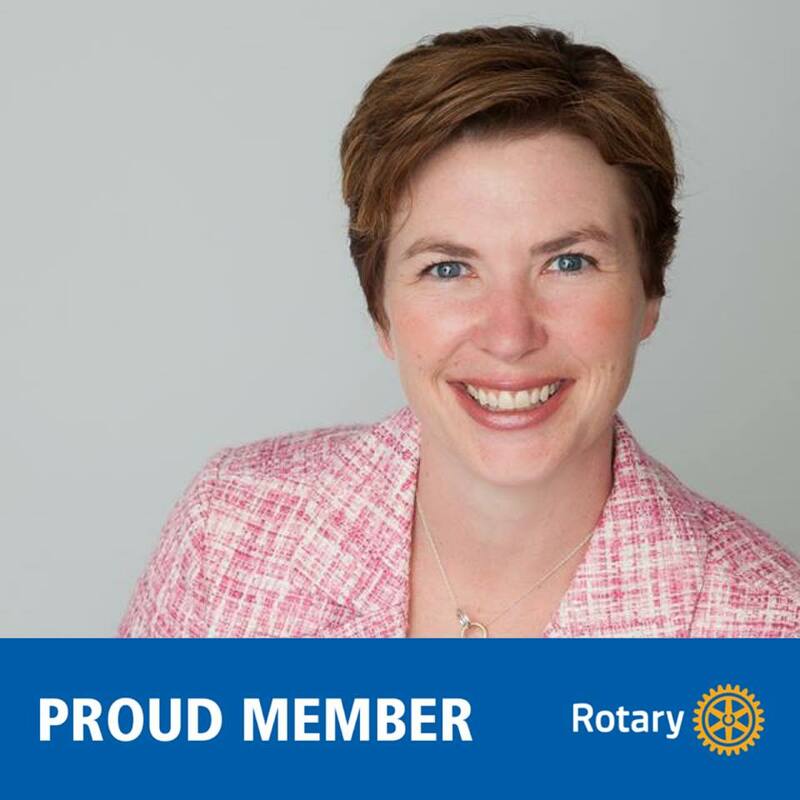 When I reflect on what inspires me, it’s people like you, it’s people I interact with every day, it’s people in other Rotary clubs. In 2018-19, the theme for Rotary clubs around the world calls all of us to “Be the Inspiration.” Just think of it . . . 1.2 million people in 200 countries all seeking to be an inspiration. If we each cause a little ripple of inspiration every day, just imagine how we can impact our community. Furthermore, when we seek to inspire people, we can have an impact not only in Lincoln, but across the United States and around the world. We’re the largest Rotary club in Nebraska, We’re one of the largest Rotary clubs in the world. Join me as I seek to be the inspiration that has an international impact. On June 26, 2018, President Jennifer Brinkman and her leadership team bid farewell. We recognized the contributions made by club members through community service, education and literacy and international service. Many thanks to the members that participated in our ongoing club projects at The Gathering Place, through Salvation Army Bell Ringing and as mentors to youth in our community. This last year we distributed over 3900 dictionaries to 4th graders in partnership with other Lincoln Rotary clubs, donated 95 books to local school libraries through our Birthday Books program and supported leadership development for youth by featuring a High School Leadership Award recipient from every high school in the community. Rise.Shine.Give. raised over $53,000 this year and with the proceeds raised over two years, Club #14 will provide $50,000 to support the implementation of the Everett Elementary School Playground renovation this summer. Our partnership with the school flourished this year. Our club was able to support the purchase of library bicycles for the Fuel Up to Play 60 program; developed relationships with students, staff and parents through the Lunch with a Rotarian program and our work with the Family Literacy Program; and provided volunteer help at the book fair, the Ukelele Club and the End of the School Year carnival. Club #14 continued our commitment to International Service with our global work in the Dominican Republic, Namibia and support for work in Kenya. The work of the UN-L Rotaract Club has raised $9,0000 towards their goal of $18,000 to provide wheelchairs to polio survivors in the Ivory Coast and our club raised another $5,023 toward Rotary International's polio eradication efforts. Our Rotary Youth Exchange program is flourishing having sponsored two outbound students this year and supporting the visits from Ruben of Spain and Kenshiro of Japan this year. Finally, our Tree Initiative is off to a great start. 23 trees were planted in Pioneers Park on Earth Day and the Lincoln Community Foundation has provided in-kind support to our initiative to plant another 65 trees along the F Street corridor to replace trees affected by the Emerald Ash Borer. Initial support from District 5650 could bring the total raised to implement the project to $16,500 to date. All 300 trees should be planted by the end of the fall planting season. It's been a great year at Rotary #14! 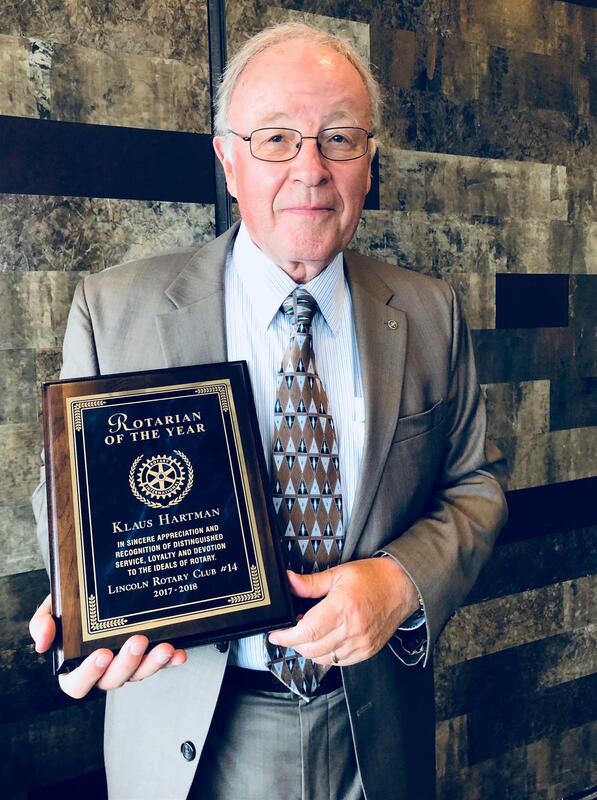 The 2018 Rotarian of the Year is Klaus Hartmann. The Rotarian of the Year is the most coveted award of the year. 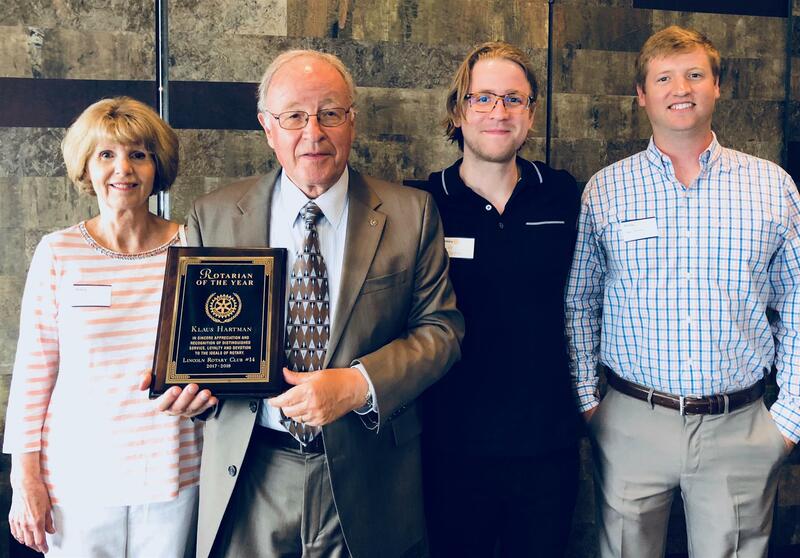 Klaus Hartmann, a medical doctor, Rotarian for 41 years, and a multiple Paul Harris Fellow, was chosen in recognition of his distinguished service, loyalty, and devotion to the ideals of Rotary. Congratulations Klaus!